The air is hot and heavy and the smell of mildew, mold, and wet drywall follows me as I walk through this unincorporated neighborhood near Houston, distributing emergency supplies. Every time I pass an enormous pile of someone’s ruined possessions on the side of the road, it gets stronger. When I step into Maria’s house, it’s all I can smell. Maria has lived in this house for 15 years and on this block for 25. They’ve had floods before, but nothing like this. The water was three feet deep throughout their entire home. You can see the watermark on the wall—like a ring around a bathtub. Because they’re so close to the bayou, this was one of the first neighborhoods to flood during Harvey and one of the hardest hit. In some homes, the water was nearly 5 feet deep. Maria walks me through her house and points out the damage with watery eyes. Her English is broken, but it doesn’t matter… there isn’t much to be said. The floors are warped and waterlogged, and there are still puddles in the bedrooms. It’s only been a day or two since the flood waters receded, but mold is already growing on the sheetrock. There are black and green spots—some as big as a nickel—all over the walls. In the living room, the only thing left on the walls is a plaque celebrating the college graduation of one of Maria’s daughters just last year. Sandra is a pastry chef, and her family is clearly very proud of her. It’s an odd mix—the celebratory plaque hanging on a moldy wall in a destroyed home. But what are they going to do? Take it down? Another of Maria’s daughters also lives in the home—she’s pregnant with her first child. She wears a breathing mask to protect herself and her baby from the mold and the bleach fumes. The family has been working so hard. In the front yard, there’s a giant pile of ripped up carpet, rugs, furniture, beds, appliances, clothes, and pretty much everything else they owned. She stops and puts a hand over her eyes. It’s overwhelming to think of what comes next. Everything that needs to be done. And how on earth they’re going to afford to rebuild. This neighborhood was impoverished before the storm. It’s technically not even part of Houston, even though it’s almost completely surrounded by the city, which means families here rely on well water… and that well was contaminated by the storm. They don’t have access to clean water, their septic systems were ruined, and they don’t have enough resources to rebuild. And yet no one had come to help them. As we went door-to-door with our local partners, delivering cases of water, cleaning supplies, hygiene kits and diapers, we were told that this was the first help they’d received. And they need so much more. 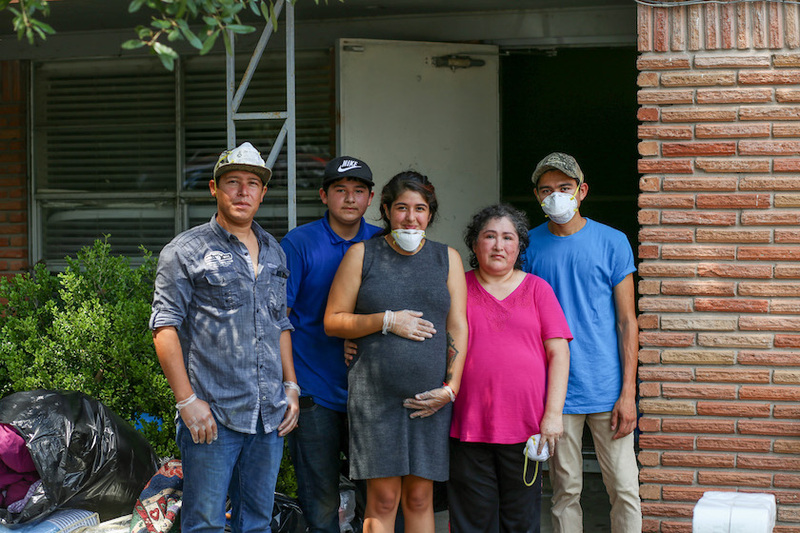 Few of these families have flood insurance—almost none of them could have afforded it. Their homes need extensive renovation before they’re livable. It will take thousands of dollars to replace everything that needs replacing. And families like Maria’s simply don’t have it. Especially not right now when they also need a crib, baby clothes, and everything else required for a first baby. These are the ones we know you want to help. The marginalized, under-resourced, and forgotten. The ones who no one else will love. You have been so incredibly generous with your outpouring of love for these families. This is our commitment to you—and them: we’re going to keep showing up. No one knows yet how long it will be until these families have clean water again, so we will stand in the gap. But we want to do a lot more than distribute emergency aid and cases of water. We want to help families rebuild their homes and their lives. We want to interrupt the cycle of poverty that left these families especially vulnerable to the effects of the storm. There is so much to be done right now in Houston and the surrounding area. But Maria, her family, and others like her will not have to go it alone. Because you’re not only first in. You’re last to leave.